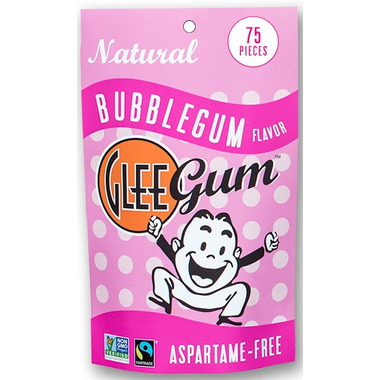 Glee Gum is sweetened with cane sugar, traded in compliance with Fairtrade Standards, total 42%. It is also sweetened with brown rice syrup. Sugar-Free Glee Gum is sweetened with 100% xylitol from American birch and beech trees. Xylitol is a safe alternative to artificial sweeteners and benefits dental health. 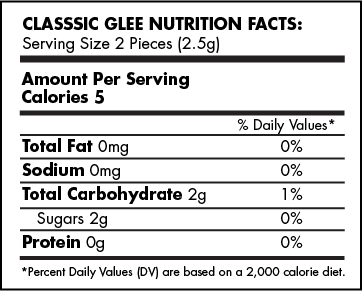 Glee Gum contains NO artificial preservatives, flavors, colors, or sweeteners (e.g. aspartame, saccharin or cyclamate). All Glee Gum is: Vegetarian, Non-GMO Project Verified, Certified Kosher, Additive Free, Dairy Free, Wheat Free, Gluten Free, Egg Free, Yeast Free, Nut Free, and Peanut Free. Soy is Present in the Facility. The flavour is gone too soon. This gum is great for about 5 minutes and then the flavour is gone. Tastes great but I won't be buying it again because the flavour just doesn't last. This gum has a yummy taste (there is a hint of cinnamon) but the flavour does not last long unfortunately. Super yummy, no aspartame! So hard to find gum without it these days, and Glee Gum does the trick. The kids love them too! Tastes just like regular gum, last just about as long too. Have bought many times, and will continue too!